Tourists should know how to enjoy a vacation. 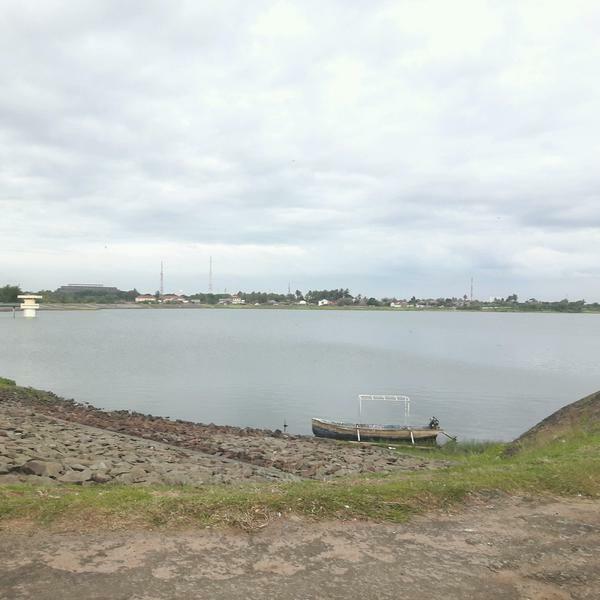 In Banten Province, there is a recommended tourist spot called Krenceng Lake. The location is in Kebonsari Village, Cilegon. Usually, people come to the lake to enjoy the beautiful scenery and to relax. Not many people are seen there, though. Due to this reason, you are able to enjoy its peaceful atmosphere. The water of the lake is calm and the nuance is chilling. It is definitely a recommended location to spend either holidays or weekends. Don’t forget to come with your families or friends, as well. In terms of beauty, Krenceng Lake is stunning. As mentioned before, the water is quite calm. From afar, you can see mountains and hills. In some parts near to the lake, there is a grassy land. You can find several stones, too. The thing is you can’t see any trees there. Despite this plain nuance, the wind is gusty. It makes you comfortable in spending a vacation in such location. Some parts of the lake also become a good object for photography. Make sure you don’t miss this opportunity. The location of Krenceng Lake is near to the downtown. No wonder, you can easily reach the lake regardless of the transportation. The most crowded time is in the fasting time. It is because the locals come to the lake for “Ngabuburit”. It is the time before breaking the fast. These people gather in the lake to enjoy a calm afternoon. As a tourist, you will find it soothing and calming. You also have the chance to make new friends there. Also, it will be helpful if you can speak the Indonesian Language. The water is calm and clear. Thus, the best location for relaxation is near to the water. You can simply sit on the grass and enjoy a calm nuance there. Apart from the locals, the visitors also come from other provinces. It is because travelers are curious about such reservoir. Not to mention they would like to do several things like photography and relaxation. When it comes to facilities, there are only several food or drink vendors. They come to the location, especially for the holidays. Another fun activity in Krenceng Reservoir is enjoying the sunset. Thus, the best time to visit is before dusk. Somehow, it creates a romantic atmosphere. Thus, you should take advantage of this situation and come with your spouse or lover. If you don’t want to spend money on foods or drinks, you can simply carry snacks and bottled water. Don’t litter, though. There are many ways to reach Krenceng Reservoir. It will be easy if you live nearby. For those who come from Jakarta should spend about 2 hours. It is because the distance is 111 km. For a faster trip, you can take a private vehicle. If you can’t drive, you can simply rent a car and a driver. This costs more money, though. Thus, make sure to prepare the budget beforehand.